This pendant was carefully shaped so that there is a smooth, wide surface area of skin contact over the throat or heart chakra. Astrologically, green quartz strengthens the influence of Mercury in one's chart. Green gems are associated with the heart chakra which is responsible for love and relationships. Physically, the color green is cooling. Mentally and physically it is soothing, relaxing, and alleviates anxiety. Spiritually it is associated with growth, calmness and learning. This is a very large gemstone pendant. Please take note of the dimensions! This pendant has been specially designed so the wearer will get the beneficial electro-magnetic radiations of the Green Quartz gemstone touching the skin. The Green Quartz gemstone weighs approximately a whopping 60 carats. 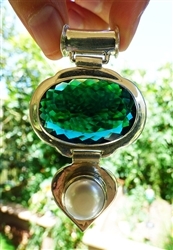 The dimensions of the Green Quartz are 34 mm wide, 22 mm high. The pearl is approximately 9 - 12 carats. The total length of the pendant is approximately 75mm. The Green Quartz is unheated, laboratory grown, not a synthetic stone. The dimensions of the Green Quartz gemstone are 34mm wide by 22mm high, it weighs approximately 60 carats.